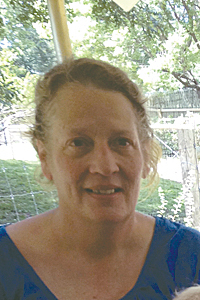 Elisabeth Jane Olson, 58, of Creston, IA was released from earthly cares and suffering Aug. 1, 2018. Lisa was born in Webster City, Oct. 16, 1959 to William and Mary Hanke. She lived in Webster City into adulthood, marrying David R. Clark. They were parents of two wonderful children, Megan and Alexander. Aug. 1, 1989, Lisa married Kenneth Olson in Denison, IA, later living in CO and Creston, IA. Lisa was preceded in death by her parents, grandparents James and Marion Hanke and Thora and Howard Furman. She is survived by her children, Megan (Jake) Williamson and Alexander Clark, spouse Kenny, and twin grandsons Finn and Leo, all of Creston. Also, siblings Christie Thompson, Bill, Bruce, Meg, and Christopher Hanke, Linda Shillington, Molly Meyer and Katie Fenn, many nieces and nephews. She was a gentle, sweet soul and will be missed by all who loved her. Private family service to be held at later date.